IMPORTANT NOTE! : Please remember to water sparingly or moderately when your tomatoes start to ripen. Otherwise you'll have a waterlogged, mushy, cracked tomato! This goes for ALL of your heirlooms! African Queen ($6.50) 80 days. Big delicious 1 to 2 lb deep-jade pink fruits with red flesh have all the delicious flavors and juiciness you expect from the old time varieties. A fabulous, renown old family heirloom, African Queen has been grown for generations on the steep hillsides of western North Carolina by the Jack Maderis family and most likely came with slaves from The Caribbean. Just marvelous! Everything you expect in a big beefsteak heirloom! I've been hearing about this extremely rare fruit in heirloom tomato circles--everyone wants it! We've got it! Incredibly high production. From Lisa VonSaunder, "A fabulous tomato in every way you can measure. A huge tomato with some of the most outstanding flavors I've ever known. I never saw tomato plants grow so large so fast. Huge plant with stems like tree trunks. The first tomatoes of the season were one pound, then the fruit started coming in larger and larger and larger until they were the largest of all my tomatoes this season. Fabulous deep, rich, pink fruit that beat all the others in taste. They grew so large the branches were drooping even with one fruit on them. So, if you want to win first place for size but you treasure flavor above all else, this is the tomato to grow! Do you want to have the most tomatoes ever grown on a vine? Then this is the plant for you!" Photographs by Lisa VonSaunder of Amishland Seeds, and Dianna Thessen, used here with their kind permission. Tati's Wedding ($6.50) 80 days. Tati is short for Tatiana. This big luscious beauty -- the most flavorful variety I've come across this season and my top pick for 2017, was discovered by my customer Dan Stein of New York as he drove through the Kazbek mountains in the Caucasus of Georgia, south of Russia. He was there on a special day, his friend Tatiana's wedding, when he stopped at a roadside produce stand and discovered this fabulous tomato. The farmer had not name it, so Dan called it Kazbegi Red. After hearing this beautiful story, I couldn't resist naming it for Tatiana, whose nickname is Tati. These tomatoes are luscious, meaty and silky with big sweetness and just enough tang to make it the perfect all purpose tomato and one of the juiciest I've ever found. So productive, you'll get dozens of delicious tomatoes in varying sizes and shapes on the same plant, from 5 oz. up to16 oz. or more. This is one of the most delightful traits of the heirloom tomatoes. The tomato in the photograph weighed 16 ounces and was grown this season by my customer and friend Barbara Kraus of Rancho Palos Verdes, CA. After our Tati's Wedding plants were demolished by rampaging raccoons, Barb came to my rescue and grew out some plants in her garden. Without Barb we would not have any photographs or seeds or plants of this incredible for you! Yay, Barb! Brandywine OTV ($6.25) (B) (E) 72 days. A truly marvelous stand-out member of the great family of Brandywines, this one arose in Craig LeHoullier's garden years ago. Big 1 pound red fruits with orange shoulders and complex rich flavors. An outstanding tomato for your garden; it also sets fruit very well during high temperatures and bears all season. A reliable producer, very disease resistant, and easy to grow; OTV stands for Off The Vine, which was a wonderful online tomato newsletter published by Carolyn Male and Craig LeHoullier. They describe this tomato as "the best strain of Brandywine set apart from others by its smooth, creamy, almost buttery texture, and harmonious sweet flavor." It originated from a natural cross-pollination of Yellow Brandywine and an unknown red parent, and was further developed and stabilized by Carolyn Male. Clint Eastwood's Rowdy Red ($6.25) (HG) (E) 78 days. From Gary Ibsen, owner of Carmel TomatoFest, "Clint Eastwood's Rowdy Red is a deep-red, round, beefsteak type fruit with a robust unruly tomatoey flavor and firm, juicy flesh that invites tomato feasting and seed-saving. The tall, indeterminate, very disease resistant plant produces loads of 3" to 4", 10-12 oz. fruits. " "This is one of those big, bold tasting tomatoes that is not for sissies," said Ibsen. "Although it has some of the highest sugar levels I've ever seen from a tomato, the sweetness is in the background and its fruity flavors are balanced beautifully with plenty of acidity, earthy nuances and flavor complexity. It's a perfect tomato for eating fresh, cooking or canning." "Clint Eastwood's Rowdy Red has proven resistant to several of the most common tomato diseases: verticillium wilt, fusarium wilt, nematodes and tobacco mosaic virus." "Within the hundreds of varieties of heirloom tomatoes I've grown each year has been a selection of previously undistributed, un-named varieties, the seeds of which have been handed down within different families from around the country for generations, then tucked into letters from gardeners wanting to share their legacy with me." "The seeds of this variety came from Archie Millett who from the foothills of the Sierras. Archie was a tomato breeder with the University of California at Davis since the early 50's. Following years of crossing thousands of tomato varieties at the university to produce a disease resistant tomato with intense flavor, he retired in 1987 and continued cross breeding to enhance the flavor qualities of his favorite tomato from his small home garden." "Archie gave me these seeds by pressing them into my palm while we were in his garden," said Ibsen. "He said, "Here Gary, these are for you. I've only shared these with friends and family. This is the best tasting tomato of my 50 years of growing tomatoes. Name it what you want, share it with others. You are the person I'd like to introduce this tomato to the public." Costoluto Genovese ($6.25) (P-S) (E) 70 days. A big beautiful and classic Italian heirloom, the deeply fluted, ribbed intensely-red 8 oz. fruits are mouthwatering and utterly scrumptious. This stunning tomato has a splendid, complex old-time flavor which makes it a perfect choice for sauce and fresh eating. Cuostraleé ($6.25) (Koh struh LAY) (BBB) 85 days. Big, hearty, prolific plant, with HUGE red beautiful beefsteak tomatoes, up to 4 lbs. I have to use both hands to pick them. Gigantic fruits have a superb, classic tomato flavor. Very easy to grow, disease resistant and a reliable producer, in my top 10 favorites. Another hot weather favorite which will grow easily and wonderfully in all gardens. Druzba (DROOZH-Bah) ($6.25) 80 days. This is a very special favorite of mine which I've grown for my personal stash for a long time. Because it's such an extraordinary variety, I have sent plants of Druzba as an alternate for Goose Creek which is not available this season. Everyone likes Druzba better. Soon I began getting calls from customers who loved it and begged me to send them another Druzba! I think you will agree that it has a very robust, rich, concentrated tomato flavor borne in smooth, perfectly round, deep-red, blemish-free 10 to 16 ounce fruits with good disease resistance and high production. As seeds of SunMaster are no longer available I have chosen Florida 91 as the perfect alternate plant for my customers in extreme high heat areas who want to have a plant that keeps producing in high summer heat. This specialty tomato, a very heat tolerant hybrid variety has the 'heat gene' and produces delicious, bright red, 10 ounce, rich, sweet full-flavored tomatoes in only 72 to 80 days. A small determinate plant, growing to 2 or 3 feet, this variety sets fruit easily during high heat, when days are up to 97º or hotter and night temperatures are 73º to 82º. Very disease resistant. Ideal for slicing onto sandwiches and salads, these sweet tomatoes ripen to be firm, solid, and resistant to cracking. Goldman's Italian-American ($6.95) 80 days. Due to unprecedented customer requests, I am including this marvelous tomato for 2010. 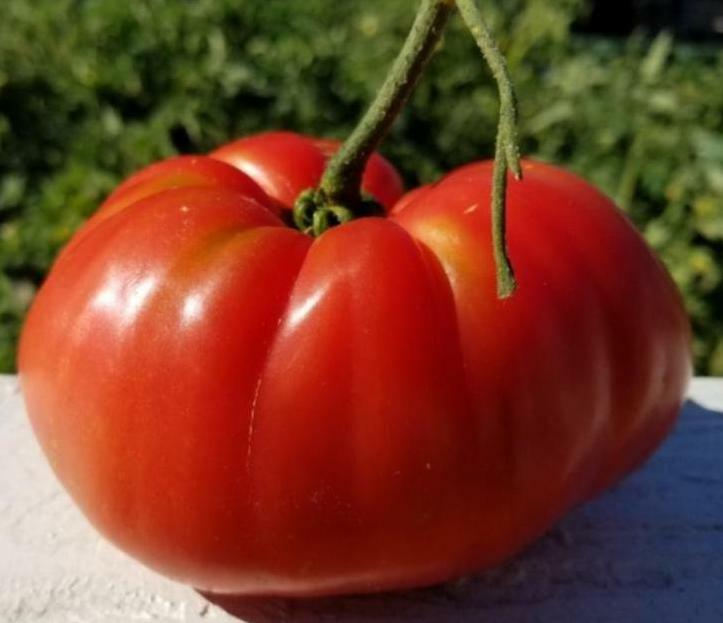 Heirloom Guru Extraordinaire, Amy Goldman, found this delightful full-figured, big-flavored tomato at a roadside stand in Cernobbio, Italy and named it after her father's Brooklyn, NY grocery store. With very few seeds, Goldman's Italian-American is a terrific choice for cooking--makes a very silky sauce, creamy paste and adds some magic to soups and stews. Pear shaped, blood red, juicy and meaty, growing to about 12 to 16 ounces with a beguiling ruffled shape, it is in such high demand that seeds are almost sold out everywhere. I managed to get my hands on 250 seeds only, so please order early! Photograph of Goldman's Italian-American is the property of Baker Creek Seeds and used here with their gracious permission. A saucy classic with huge production! Italian Heirloom ($6.25) (P-S) 85 days. The name says it all. Unbeatable for production and flavor, thin skinned and easy to grow. A real classic from Italy and a top seller here. Producing loads of big, fat, juicy, delicious, 5 to 10 oz. brilliant red, meaty, elongated, slightly pear-shaped tomatoes with an abundance of rich, complex flavors you'd expect from the best Italian varieties. This tomato is revered by the Italians for its BIG taste and high production. Whether for fresh eating or cooking, you will fall in love with Italian Heirloom. Mortgage Lifter aka Radiator Charlie's Mortgage Lifter ($6.25) 80 days. a newspaper photograph from 1964. This gigantic legendary heirloom from Logan, West Virginia developed by M.C. 'Charlie' Byles in the 1930's, is huge, sweet, juicy, delicious and prolific, with splendid old time tomato flavor. The meaty pink-red fruits weigh at least a pound, averaging 2½ lbs. and reaching up to 4 lbs. A very prolific plant which continues to bear fruit right up until frost, it also keeps very well. Marshall Cletis Byles, who much preferred to go by MC or just Charlie, owned a garage specializing in radiator repair. He developed Mortgage Lifter over a six year period by crossing German Johnson, Beefsteak and 2 other really big varieties, all chosen for their huge size and grand flavor. He sold the resulting plants for a dollar each (in the 40's), and was able to pay off his $6000.00 house mortgage in only 6 years with the profit from his plant sales. "I didn't pay but six thousand dollars for my home, and paid most of it off with tomato plants", said Charlie in a tape recorded interview with his grandson which aired recently on National Public Radio. Charlie's repair shop was at the bottom of a steep hill so travelers whose radiators over-heated during the climb had to coast back down to Radiator Charlie's for repair. Other folks heard about these huge luscious tomatoes and came from hundreds of miles to buy the plant. As my customer John in Virginia says, "It's just not a real tomato garden without Mortgage Lifter." Charlie Byles lived to be 97 years old. A Laurel's TOP PICK for 2018! Queen of the Sea ($6.50) 80 days. This huge, luscious ruby-red jewel comes to us from the fertile fields bordering the banks of the Adriatic Sea in the northernmost region of the Mediterranean Sea. These big, hearty tomatoes are heavy-in-the-hand and grow in clusters of 3 or 4, each weighing 10 oz. to 2 lbs. and have the depth of flavor and fragrance we long for in our gardens. Sweet, rich and meaty with silky texture and incredible flavors, I am tasting one as I write this--right now--true story. Sweet! Wow. This tomato is fabulous! I’ve called it Queen of the Sea to honor the generations of gardeners and farmers in the countries surrounding the Adriatic Sea who have grown, and are still growing, this outstanding tomato. Seeds of this high-producing beauty are from Meri Jelenic Bijelic of Rancho Palos Verdes, California. The tomatoes in the photograph were grown by my friend who helps me grow out new varieties, 'Tomato Foster Mom' Barbara Kraus, from the same town. Sunset's Red Horizon ($6.25) F/C (B) (E) 72 days. This huge, red, ambrosial and glorious fruit is hugely popular in the heirloom tomato world -- one of the best tasting tomatoes in existence. 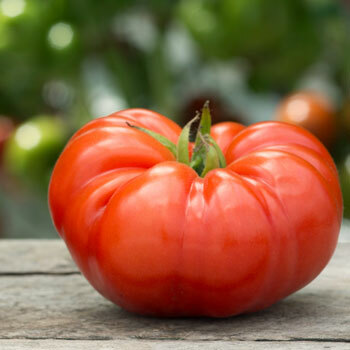 Producing like a champ in cool and hot weather, resistant to frost and heat, it is a splendid producer of big red Oxheart shaped, 5" fruits with fabulous old-time intense tomato flavors and silky texture. From 10 to about 16 ounces it produces early and continues bearing lots of yummy fruit into November and December. Sweet Scarlet Dwarf ($6.50) 78 days. This vigorous dwarf plant produces a heavy yield of 10 to 16 ounce smooth, sweet and tangy, red tomatoes with a superb, intense concentrated tomato flavor. One of the best of the Dwarf Tomato Project varieties, it may surprise you by producing and occasional yellow or orange tomato on the same plant. Be sure to try them, they taste fantastic, one of the thrills of growing in the heirloom world! TOP SELLER AND Laurel's Top Pick! This big luscious beauty -- the most flavorful variety I've come across this season and my top pick for 2017, was discovered by my customer Dan Stein of New York as he drove through the Kazbek mountains in the Caucasus of Georgia, south of Russia. He was there on a special day, his friend Tatiana's wedding, when he stopped at a roadside produce stand and discovered this fabulous tomato. These tomatoes are luscious, meaty and silky with big sweetness and just enough tang to make it the perfect all purpose tomato and one of the juiciest I've ever eaten.